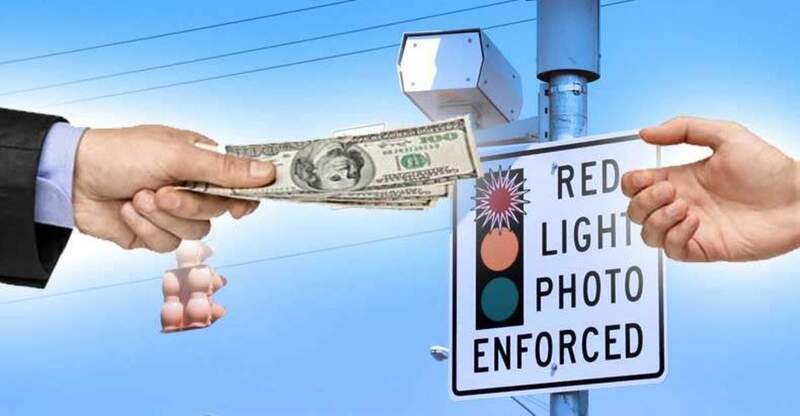 Columbus, Ohio – It was reported this week that the city of Columbus was forced to terminate its contract with Redflex, the company that provides all of the red light cameras in the area. The termination is the result of a recent court case, where former Redflex CEO Karen Finley pleaded guilty to bribing politicians as a part of the company’s business strategy. However, the mayor did also say that his office is generally in support of red light cameras, but that they just had to cut ties with this company over the alleged corruption. The mayor seems to think that hiring a different company would be somehow less corrupt. Mayor Coleman, along with Columbus City Council President Andrew Ginther claimed that they have nothing to do with the allegations and have turned over documents relating to the case to federal investigators. “I think ultimately this is in the best interest of the people within the city of Columbus because this company very clearly had a culture within it, doing things that were inappropriate and improper and in some cases even legal. The people in the city of Columbus don’t want the city to do business with a company like that,” Ginther told NBC news. The town’s politicians, while denying wrongdoing, insist that the red light camera program makes the roads safer, however, critics say that they are primarily for generating revenue. Depending on which state you live in, red light cameras could be bringing in well over $100 million to your city’s government. “Revenue seems to be driving the red light camera rage. If cities were truly concerned about intersection safety, their engineers would be applying sound engineering practices that improve compliance with traffic laws and traffic signals while reducing accidents rather than installing ticket cameras. “I find it very revealing that Lockheed Martin, one of the biggest manufacturers of red light cameras in the U.S., has included clauses in their contracts that prohibit city engineers from applying engineering practices that improve compliance and reduce accidents, apparently to maintain the flow of ticket camera revenue. Lockheed Martin specifically prohibits cities, such as San Diego, California, from changing the timing of yellow lights in intersections that host their cameras, even though increasing the yellow light time has proven to dramatically decrease red light violations. “In Fairfax County, Virginia there has been a 96% decrease in red light violations at the intersection of US50 and Fair Ridge Drive, but only after the yellow light time was increased by 1.5 seconds. And, Lockheed Martin has asked Mesa, Arizona for approval to remove cameras from intersections that no longer generate meaningful revenue. The cause is an increase in the duration of the yellow light time at the intersections. In the typical Lockheed Martin contract, the company doesn’t get paid unless a ticket is issued. At the very least, there is a definite conflict of interest due to the fact that if the intersection has no violators, Lockheed Martin has no profit. “And, ticket cameras have definitely shown a profit. California recently raised their red light violation fines to $271 per ticket (Lockheed Martin receives $70 of that). Washington DC has started using photo enforcement and has stated it expects to receive $160 million in traffic fines by 2004. “Not only has the sheer number of tickets issued and money reaped increased, but the type of photo enforcement and surveillance the government uses has also vastly increased. There are red light cameras, speeding cameras, railroad crossing cameras, and most recently face identification cameras. Tampa Bay, Florida is now scanning the faces of pedestrians on the street to compare them to their database of criminals. The Colorado Department of Motor Vehicles is investing in a camera system that will map the face of anyone with a driver’s license thus creating a photo database of the vast majority of their population. How long until the system used in Colorado is married to the system used in Florida? Raise the fines for littering, jaywalking, or any other ticketable offense and you now have another cash cow ready to be milked. Want to learn how to get out of a red light camera ticket? Check out our article from 2013 detailing how one of our readers avoided his red light camera ticket. John Vibes is an author, researcher and investigative journalist who takes a special interest in the counter-culture and the drug war. In addition to his writing and activist work he organizes a number of large events including the Free Your Mind Conference, which features top caliber speakers and whistle-blowers from all over the world. You can contact him and stay connected to his work at his Facebook page. You can find his 65 chapter Book entitled “Alchemy of the Timeless Renaissance” at bookpatch.com.